The Panasonic devices are ideal for all the conditions we work in. Cambridgeshire Fire and Rescue Service is transforming life for firefighters on the frontline by equipping them with Panasonic rugged Toughpad tablets to access vital information during an emergency. Panasonic Computer Docking Solutions team has designed the mounting solution for the Panasonic CF-D1 tablets in the front of the vehicle. The team utilised as much of the existing infrastructure as possible, such as the power management units, to keep costs down. 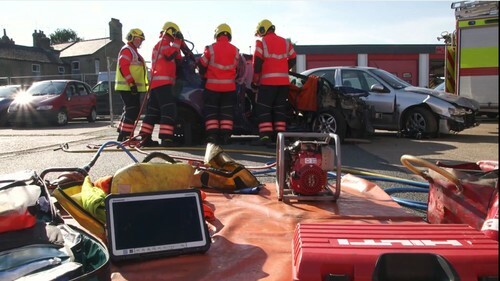 It has also future proofed the vehicles by fitting antennas that will work with the imminent introduction of the new Emergency Services Network. For the rear vehicle mounted FZ-G1 tablets, the solution team designed a bespoke bracket for Cambridgeshire that can be fitted on all its vehicles genericaly. The design also incorporated into the bracket a handheld barcode reader, so that it could be installed in a convenient location next to the tablet. The Panasonic Toughbook CF-D1 has a larger 13.3" widescreen HD IPS display to easily run real-time diagnostic programmes, read telematic data and view schematics and designs. The screen has been specifically built for clarity both inside buildings and outside in bright sunlight. The resistive touchscreen allows for easy data input using fingers, gloved hands or pens. Powered by the sixth-generation Intel® Core Platform and runnning the Windows 10 Pro operating system, it makes the Toughbook CF-D1 a unique tool for emergency services operators. •	Communication Solutions, including professional scanners, multifunctional printers, telephony systems and SIP terminal devices. •	Professional Camera Solutions, including Broadcast & ProAV products, security, fire alarm systems and industrial medical vision (IMV) technology. Panasonic is one of the top two professional camera vendors in Europe. •	Computer Product Solutions helps mobile workers improve productivity with its range of Toughbook rugged notebooks, Toughpad business tablets and electronic point of sales (EPOS) systems. As European market leaders, Panasonic Toughbook had a 66% revenue share of sales of rugged and durable notebooks and Panasonic Toughpad held a 59% revenue share of sales of rugged business tablets in 2015 (VDC Research, March 2016). •	All brand names shown are the registered trademarks of the relevant companies. All rights reserved. •	All working conditions, times and figures quoted are optimum or ideal levels and may differ as a result of individual and local circumstances. •	Specifications, product availability and price given herein may be changed at any time without prior notice.